How to find the area of the kite? How about kite perimeter? 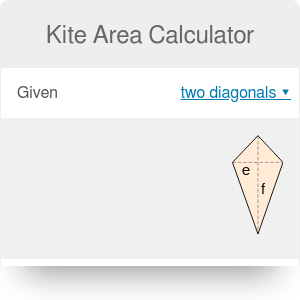 If you are looking for the formula for kite area or perimeter, you're in the right place: the kite area calculator is here to help you. Whether you know the length of the diagonals or two unequal side lengths and the angle between, you can quickly calculate the area of a kite. For kite perimeter all you need to do is entering two kite sides. But if you are still wondering how to find the area of a kite, keep scrolling! If it's not a kite area you are looking for, check our kiteboarding calculator, which can help with the choice of the proper kite size for you. area = a * b * sin(γ), where γ is the angle between sides a and b. Did you notice that it's a doubled formula for the triangle area, knowing side-angle-side? Yes, that's right! Kite is a symmetric quadrilateral and can be treated as two congruent triangles that are mirror images of each other. You can't calculate the perimeter knowing only the diagonals - we know that one is a perpendicular bisector of the other diagonal, but we don't know where is the intersection. Let's imagine we want to make a simple, traditional kite. How much paper/foil do we need? And if we're going to make an edging from a ribbon, what length is required? Think for a while and choose the formula which meets your needs. Assume we found two sticks in the forest, let's use it for our kite! Enter the diagonals of the kite. The ones we have are 12 and 22 inches long. 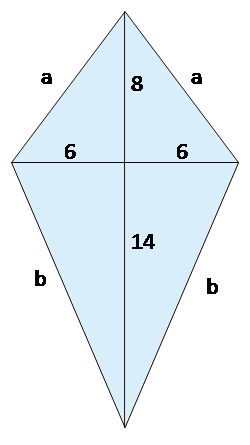 Area of a kite appears below. It's 132 in². Assume you've chosen the final kite shape - you've decided where the diagonals intersect each other. For example, the shorter one will be split in the middle (6 in : 6 in) and the longer one in 8:14 ratio, as shown in the picture. Next, the easiest way is to use our right triangle calculator (this method works only for convex kites). Type 6 and 8 as a and b - the hypotenuse is one of our kite sides, here equal to 10 in. Refresh the calculator and enter 6 and 14 - the result is 15.23 in and that's our other side. Here you go! As we know both sides, we can calculate the perimeter. Type the a and b sides. The result for our case is 50.46 in. So buy a little bit more ribbon than that, for example 55 inches to make the edging. The kite can be convex - it's the typical shape we associate with the kite - or concave, such kites are sometimes called a dart or arrowhead. The area is calculated in the same way, but you need to remember that one diagonal is now "outside" the kite. The kite area calculator will work properly also for the concave kites. The answer is almost always no. It's working the other way round - every rhombus is a kite. Only if all four sides of a kite have the same length, it must be a rhombus - or even a square, if additionally all the angles are right. Kite Area Calculator can be embedded on your website to enrich the content you wrote and make it easier for your visitors to understand your message.